Edmontonian Jaime Calderon, who travels to Calgary weekly for work, currently rents a one-bedroom room in Calgary’s N.W. 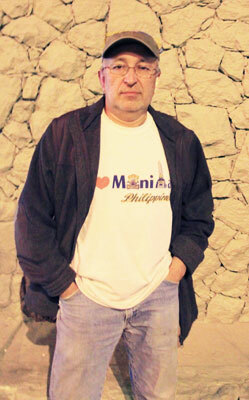 Jaime Calderon currently rents a one-bedroom room within a bungalow in the N.W. neighbourhood of Dalhousie. The 57-year-old doesn’t see the room as being the best accommodation, but has no time to search for another place to live since he spends his work weeks in Calgary and weekends back home in Edmonton with his wife and two children. Calderon currently pays $550 per month, which includes his utilities. 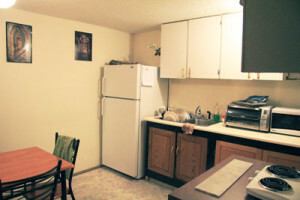 Although a low price for Calgary’s market, he believes the rent is not reasonable because of how “decrepit” the room is. The owner of the home that Calderon rents from has arranged it so that three single male renters live in the basement and three single female renters live on the top floor of the home. Within the basement there are three bedrooms, all of which share one full bathroom, a washer and dryer and a kitchenette. In addition, there is a separate door to access the basement. Within the three-bedroom basement, two bedrooms are legal and one is illegal, Calderon says. The third bedroom poses as a safety hazard as it does not have a window for an emergency exit. “So in reality, the basement should only be able to rent to two people,” Calderon says. 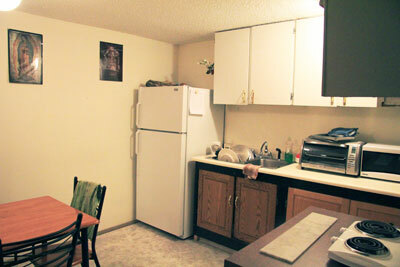 The kitchenette is comprised of a fridge, microwave, toaster oven, sink and hot plate. The stove/oven was removed last year due to a regulation complaint by a previous tenant. The regulation, according to Calderon was that every floor must have no more then one high-power electrical outlet, which in this case included the dryer and stove/oven appliance. 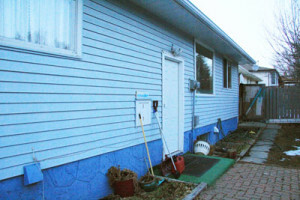 The separate backdoor is used to access the basement for male renters. The female renters who live on the main floor use the front door entrance to enter their suite.